Finding new windows is not going to be as simple as choosing the one that will look best with your home. The important factors that you should be considering further are durability and performance. The weather plays a key role in how your windows should perform as they will be your shield from the elements. Before you select your replacement windows in Chesterfield MO, it is important that you consider what materials can withstand the Missouri weather. For those of us living in the Midwest, particularly in Missouri, our homes can be affected by severe weather, including strong winds, torrential rains, and tornadoes. In addition, summer in MO can get really hot and humid, while dropping temperatures can cause bitter cold. The best choice for Missouri’s weather system are windows with a U-factor and SHGC (solar heat gain coefficient) of 0.3 or lower. SHGC is a measurement of how much heat is blocked. The U-factor, on the other h and, shows how well a product stops heat from escaping. With all the severe weather conditions that can occur, you’re going to need windows made of durable materials. Renewal by Andersen® of St. Louis, a Chesterfield Missouri windows company, can bring you the windows you need to protect your home from Missouri’s weather. Our windows are equipped with advanced technology that ensures durability and performance. The frames of our windows are made of Fibrex®. This advanced composite material is a combination of the strength and insulating capacity of wood and the low-maintenance property of vinyl. This material is also designed never to rot, corrode, break, or fade, which helps prevent air leakage. Another facet of Renewal by Andersen windows is Low-E4® glass pane. This innovative treated glass is designed to resist heat flow. This can help you retain more heat during winter and keep heat out during summer. It can help lessen the use of your heating and cooling systems, which can help reduce your power consumption. Get windows that can withstand the Missouri weather. 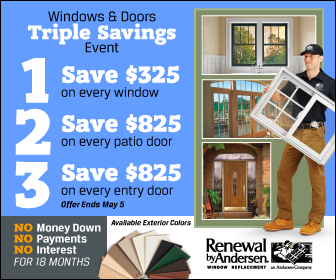 For more information, give Renewal by Andersen of St. Louis a call today!